A housecleaning still appears to be on the near horizon for the Phillies even as they hang within striking distance of first place in the National League's most mediocre division. "Well, I don't think they're going to be able to compete for a playoff spot this year, and I think they're slowly coming to that realization," a baseball scout said Tuesday. "Given the lack of depth in their upper minor-league system, I think they really need to move some guys and try to reload." He is not alone in that opinion. "For me, I would try to make some moves to bring prospects in," an American League executive said. "Even though they're 5 1/2 games out [going into Tuesday night's game in Atlanta], if you look at that club, they don't have enough to win. At some point, you have to reload, but I know that's a very difficult sell in that city." Fire sales are always difficult and complicated because they have so many layers, especially when you're talking about players as well-decorated as the Phillies' core. The bottom line, however, is this: Who are the players that bring the best return? 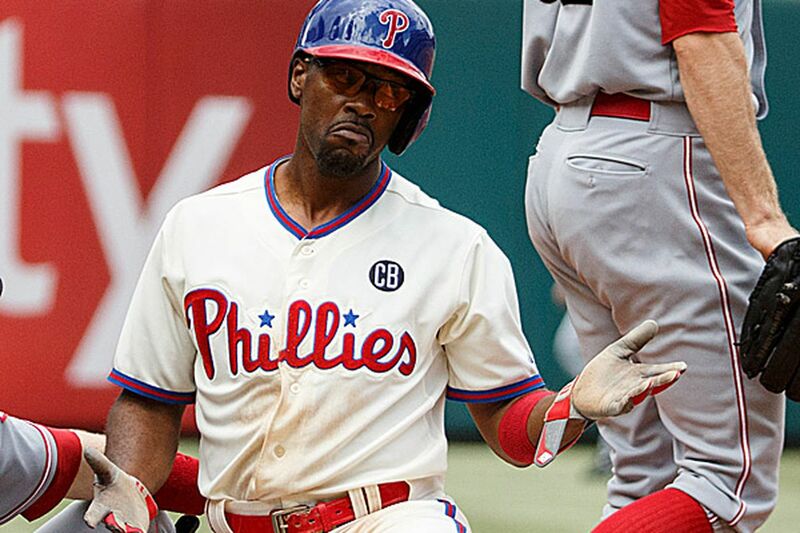 The scout and the executive agreed that second baseman Chase Utley and shortstop Jimmy Rollins are the Phillies' most valuable trade pieces because they are healthy, playing well, and have reasonable contracts beyond this season. "I would say those are the two guys right now that you're going to get the most back for," the scout said. "They are both battle-tested players with playoff experience, and I think they would really thrive in a playoff environment." The executive agreed that Utley and Rollins have value, but he said their advanced age and Utley's past knee problems will raise concerns. "I guess Utley would still have value even though he probably doesn't have that many more productive years left because of the knees," the executive said. "Jimmy Rollins has some value to some degree, but I don't know if some of those guys will get you enough in return to warrant making the trade." Cliff Lee, provided he returns from his strained left elbow and shows good form for a series of starts before the July 31 trade deadline, will also pique interest. But the timing of the injury could not have been worse from the Phillies' standpoint. The most intriguing of the potentially available players is closer Jonathan Papelbon. He is the best-paid closer in baseball, but his contract could expire after next season. He has a vesting option for 2016 based on games finished, but a team could probably talk him out of it because of how disgruntled he has been during the last two seasons with the Phillies. It's no secret the Phillies tried to trade Papelbon at the deadline a year ago and again over the winter. With the anticipated emergence of Ken Giles, it's a no-brainer that the Phillies will again try to ship Papelbon elsewhere. The problem: His reputation as a clubhouse curmudgeon is known beyond the walls of Citizens Bank Park. "I'm not a big fan of his," the scout said. "He has an abrasive mentality and personality, but I have to admit he's done a nice job of finding ways to get guys out without the same stuff he had a few years ago." The executive described Papelbon as being viewed as "a selfish player," but said some teams would be willing to overlook his shortcomings if he continues to get people out. "I think he has value," the executive said. "It's not what he used to have, but some clubs that need a closer could be willing to give up something, and other teams might view him as a legitimate eighth-inning guy. I think if you just want to move the money, you're not going to get the value you invested in him." Both the scout and the executive said that some teams would shy away from Papelbon because of his reputation and that other teams wouldn't care. "The Yankees and Giants come to mind as two teams that wouldn't care," the executive said. With Sergio Romo sporting a 5.08 ERA, the Giants could be in the market for a closer. Detroit, the Dodgers, and the Angels are also teams that could be looking for a closer, and, despite his faults and decline in velocity, Papelbon is still really good at the job and ultracompetitive. In fact, you could argue that the Phillies have never had a better closer than Papelbon over a 21/2-year span. What's that worth on the trade market?